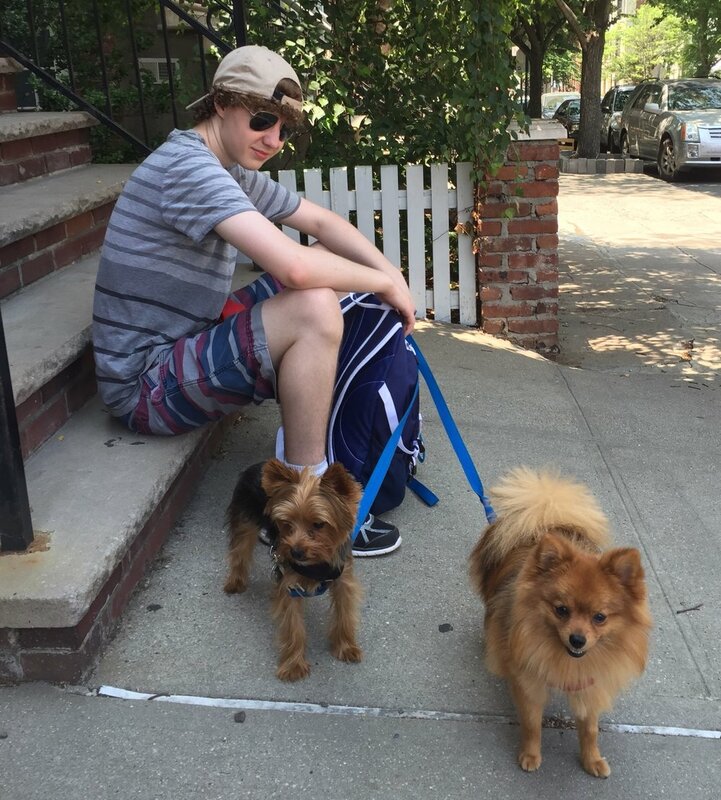 We are a professional dog walking and pet sitting team serving the Brooklyn neighborhoods of Park Slope, South Slope, and Gowanus. Why choose us? We stand out from the rest of the pack. 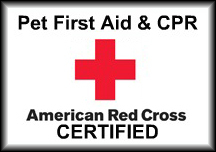 Our team is fully insured, bonded, and professionally dog*tec certified in dog walking, basic training and pet CPR/First Aid. We are skilled and knowledgeable in dog behavior and are here to help you with the challenges of urban dog walking. Your pet's safety and happiness are always our priorities. By using our own leashes and back up safety cords, we are able to ensure a level of safety most dog walkers cannot. Included in the walk is training reinforcement, treats (if allowed), a water bowl refresh, towel off after wet weather, and a note. Lunch and medication on request, at no additional charge. All pups must wear a collar with license and tags, and fitted harness or additional collar. On every walk, your dog will receive plenty of individual attention and positive reinforcement. We take great care in choosing compatible walking buddies for our pups, which is why you'll most often see us walking in pairs. On the walk, your pup will not only receive physical exercise, but plenty of mental stimulation. We strive to instill good leash manners and "urban etiquette" while also having fun! Wonder what your pup is up to while you're at work? We leave a report after every walk, and keep our clients in the loop through frequent photo updates of the pups on their outings. All standard walks are approximately 30 minutes long, and we offer tailored programs/excursions. We also care for cats and other small pets in your home while you're away. Andrea, owner and founder is a Philadelphia native, making her home in Brooklyn nearly 13 years ago. She grew up alongside an active Springer Spaniel, 3 cats, and a pet iguana. Pet deprived in college, she managed to occasionally walk friends' dogs, cats, and even ferrets, while volunteering at her local PetsMart. Six years ago, Andrea and her family finally adopted their first rescue pup, Willow. Resident kitty Chutney is getting along nicely with her housemate. Andrea holds a BA in Urban Planning from University of Pittsburgh, and an MS in Education from Brooklyn College. She has taught in a local preschool and public elementary schools and has received her Dog Walking Academy certification. She and her family are members of the Park Slope Food Coop, Gowanus Alliance, and Wildlife Conservation Society. In her free time, she enjoys traveling, nature, yoga and hanging with her two daughters, husband and dog. Michael is originally from Palm Beach Gardens, Florida and has been a resident of Park Slope since 2005. He grew up adventuring with his dog, a beagle/spaniel mix named Rebel. For the past twelve years, his best bud has been a tuxedo cat named Marlowe. Michael worked for the non-profit organization Poets House for over ten years, heading their library and educational programs. He holds a BA in English from the University of Florida and an MFA in Poetry from Columbia University. He has taught English and Creative Writing in NYC public schools in all five boroughs. In 2011, he started taking classes in comedy and performing around the city. You can see him perform on house teams for sketch and Improv comedy at the Upright Citizens Brigade and Reckless Theatres, where he also coaches and teaches. While not working, Michael enjoys exploring the city by bike, watching English Premier League soccer, and reading science fiction novels. Chelsea is originally from NH, but with family full of New Yorkers, she knew she would end up in NYC one day. She grew up alongside a small zoo - an old, adorably cranky Miniature Schnauzer, an outdoor cat, an indoor cat, birds of various kinds, and a Bichon Maltese puppy (now a 14 year old pup who thinks she still is a puppy). 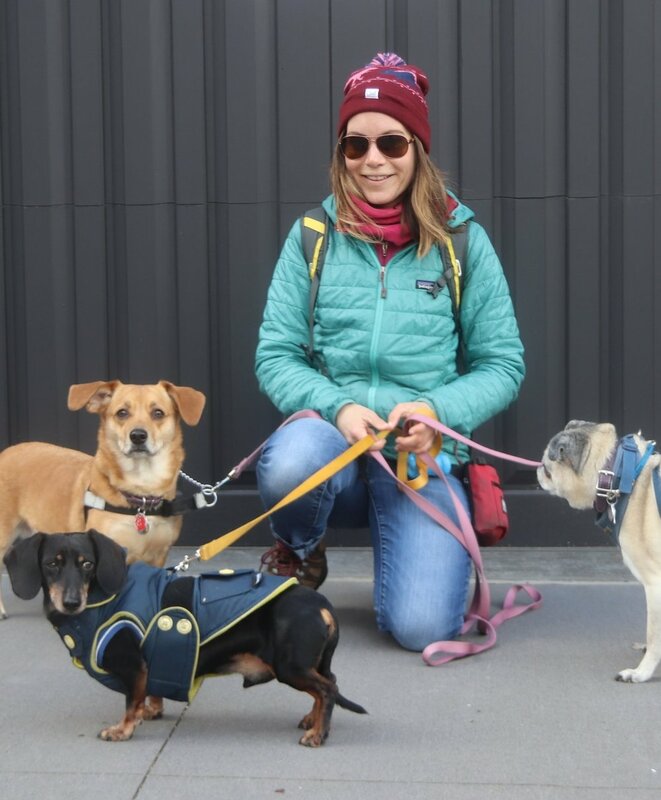 A Dancer, Fitness Instructor / Personal Trainer, and Freelance Marketing Consultant, Chelsea’s career takes her all over the city and beyond, and no matter where she goes, she always finds a dog to pet. Chelsea lives in Park Slope with her fluffy orange cat, Prince, and loves plants, learning about Anatomy, crafting, and traveling! Nick previously lived in Minnesota where he grew up with many dogs and other animals. He attended the School of Environmental Studies where he took courses on animal husbandry and animal care and learned how to take care and handle a variety of animals. After college, Nick moved out here to NY to pursue music. We want your pup to be good and tired after their walk! All walks are approximately 30 minutes. We vary our routes to keep it fun and fresh. Small group walks usually consist of 2 to 4 walking buddies who have been properly introduced. Recommended for dogs who cannot walk in a group for medical reasons, or dogs who are in need of space and would benefit from some basic training or one-to-one interaction with a handler. A 20 minute walk, personalized and tailored to your pup. Please note, private walks may not be available during our peak business hours, 11am-3pm. Please call or email for availability. All prices are subject to NY state sales tax (8.875%), and are non-negotiable. One of our professional team members will come to stay at your home with your pup overnight. Great for anxious/insecure dogs. Included are evening walk and morning walk+any feedings. We can also collect mail, water plants, adjust temperature, lighting, etc. *All midday walks are billed separately. We would love to care for your cats and other small pets while you're away. These visits are 20-30 minutes long and include playtime, litter/bedding refreshing, feeding, brushing, medication (if required), water changes, collecting mail, watering plants, etc. Puppies are much like toddlers, and need frequent supervision and positive learning experiences. We can provide this and much more in our puppy visits! - gentle socialization and sensory exploration of the neighborhood (if cleared by your vet). We kindly ask that any cancellations/rescheduling be confirmed 24 hours prior to the scheduled walk, by email. If there is less than 24 hours notice, the walk will be charged in full.